The Tuk Tuk Trike was inspired by the design of the traditional Tuk Tuk of Southeast Asia, a kind of motorized rickshaw. The name Tuk Tuk derived the typical sound made by its simple two-cycle motor. Why would Art In Motion build one here in the USA? It’s a funny story. 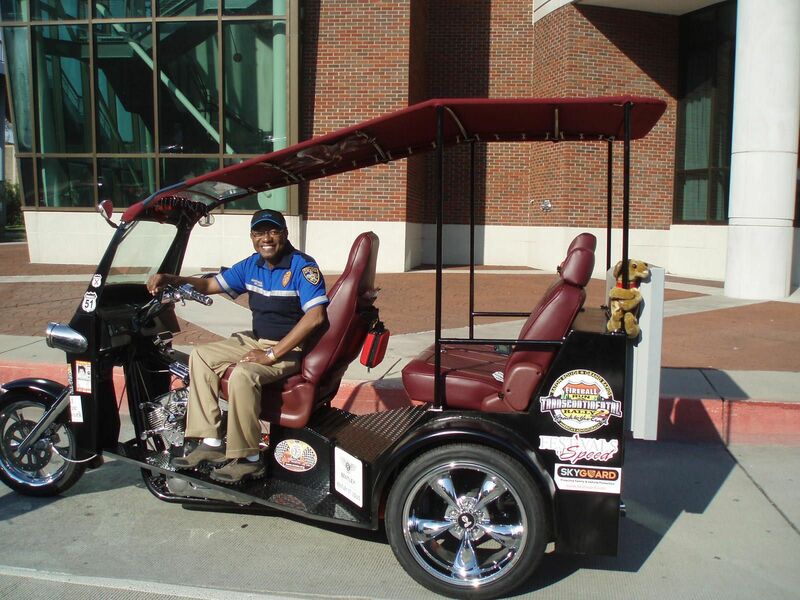 After Art In Motion had finished Flyin’ Trike, Tom and Christi visited New Orleans, Louisiana. They were visting Christi’s Aunt and Uncle to see their newly rebuilt house. Hurrican Katrina had destroyed their old house completely. While visiting, the subject of “what are you up to these days” came up, so they showed Christi’s aunt the photos of Flyin’ Trike. Christi’s aunt remarked that she had ridden a motorcycle while on vacation somewhere and dug out a picture of a Tuk Tuk trike with her on it. About a week later, Tom and Christi went to a networking event and brought Flyin’ Trike. There, they met JJ Sanchez, the owner and organizer of the Fireball Run. He had another person with him who looked at the trike and said, “that reminds me of the trike I have at home that I need to have put back together, but mine is a Tuk Tuk”. Wheels started turning in Tom and Christi’s head and before the networking event was over, somehow, they had agreed to build a custom Tuk Tuk Trike and run it in the Fireball run. Oh, and the event was only about 3 months away. With help from their frame manufacturer, Rolling Thunder Manufacturing, Art In Motion finished the trike in 6 weeks from frame to completion. It is configured for one driver’s seat in the front and a 2-passenger seat in the rear. The engine is from a Harley V-Rod and it definitely does not go ‘Tuk Tuk’.